All departments in a company regularly face the job of fulfilling projects. The initial aspects generally revolve around questions such as how to best fulfil the project target or how much time the project will require: who should do what when? This is where the project management software Projects.Net comes into play. By drawing personnel and scheduling matters into consideration and combing this information with various workflow-specific aspects, Projects.Net facilitates a well-structured project management that assists companies throughout the completion of targets. Prior to embarking on a project, the project phases need to be defined and supplemented with required sub-processes. The software Projects.Net here allows you to access all contents of a comprehensive knowledge database and allocate necessary aspects, such as persons, to the individual steps. In this initial phase of the project, it is also possible to resort to project templates, which allow you to apply the structure and content of previous, similar projects. Projects.Net uses Gantt-diagrams in order to visualize projects. This diagram allows you to identify correlations and interdependencies regarding the individual project steps at a glance. If, for instance, the chronological timeframe of a project step changes due to a delay, the project-timeline in the diagram will automatically adjust to the new circumstances. The software also dynamically adjusts to any other type of manually or automatically implemented change and thereby ensures that factors that may influence the scheduled completion of the project target are identified well in advance. Process.Net plays out one of its particular strengths by fully linking itself to the other CAQ.Net® software modules such as the document or training management modules. In conjunction with the QBD.Net document management software, for example, each document in the system can be allocated to a specific project phase or step. The document control functions in QBD.Net thereby ensure that only the most current, valid, and approved version of the document is available in the individual project. The same also applies for the e-learning functions in the training management software Qualify.Net. It provides employees with 24/7 access to relevant project knowledge which they can internalize via self-study and check their level of knowledge via a web-based interface. It does not suffice to just design a project – one must also ensure that all relevant employees can put it into practice and work on it together. As Projects.Net is a database-aided software solution, employees around the globe can collaboratively work on a given project in real-time and across any number of sites. This constitutes a major advantage over file-based software solutions that merely permit single-point access. Allocate persons, documents, tasks, etc. 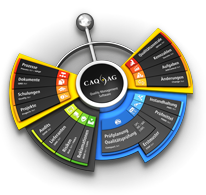 In order to bring together all employees in the project effort, the system includes powerful CAQ Enhanced Mobility Concept web-applications for cross-platform online/offline working. Sophisticated task and escalation management functions ensure that all persons responsible are continuously kept up-to-date and the success of the project always remains in everybody’s focus. Projects.Net supports you throughout the initial preparation and planning of projects all the way to their successful completion. Whether or not all steps of a project actually fully achieved the desired result is established in the subsequent analysis of the project. Here Projects.Net supports you with a whole host of evaluation tools that allow you to identify valuable knowledge and improvement potential. This information flows directly into the central knowledge base where it can be used for any future project. All of this serves as basis for creating a dynamic and continuous improvement process for your overall project management.